There is something about stitching that makes me relax. Anxiety and tension melts away in a short time after I begin stitching. It must be the repetitive nature of needle and thread going in and out of fabric with each stitch I make, that takes me into a meditative state. I feel like an artist creating a palette of colors when I choose and collect the floss for my stitching project. The most fascinating part is watching a design come to life on the fabric with every row of stitches made. Stitching unique gifts for others is very rewarding. Whether it is a card, framed picture, pillow, or decorative stitching on a garment, the smile and admiration that appears on the face of the recipient is so special. It feels good to make someone happy or to express your gratitude for someone with a one of a kind gift. The tradition of handmade needlework dates back to ancient civilization. In the age of technology, I feel that I am contributing to keeping an art form alive. It is rewarding to create heirlooms for future generations to treasure. How about you? 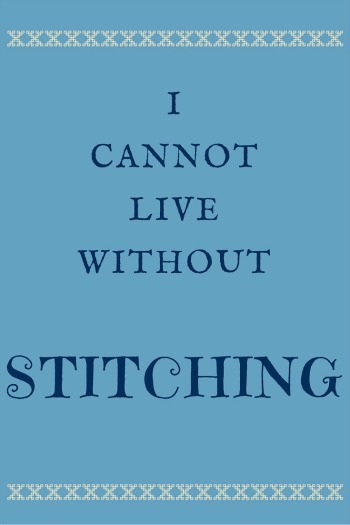 Why do you stitch? Share your reasons in the comments below. I would love to know what type of needlework you do and why you like to stitch. © 2015 Anne Cole. All Rights Reserved. Join our e-mail list and receive our free PDF pattern download. Just complete our subscription form. AC Needlework will not share your email information.